Dear Readers, if you are seeking for the latest Government Job in Railway department then you are at the right place because here, we are going to share each and every detail regarding the MMRCL Station Controller Recruitment 2017 in the following sections of this article. Competitors who want to make their future bright in Railway department then they must read this article and then you may all apply online for this MMRCL Vacancy 2017 from the official website of Mumbai Metro Rail Corporation Limited that is www.mmrcl.com. You can get more details from our careerjobs360 page because our professional team updates this page as per the latest information. Mumbai Metro Rail Corporation Limited has depicted the Job notice for MMRCL Recruitment 2017 for filling up 115 Station Controller, Train Operator, Junior Engineer, Section Engineer and other various posts in the MMRCL department. The Railway department is now looking for the deserving and skilled candidates on the various vacant posts in the department. Job Finders who want to do a job in Mumbai Metro Rail Corporation Limited they may apply for this MMRCL Section Engineer Vacancy 2017 from the official website of MMRCL i.e. www.mmrcl.com. Interested candidates may fill the application form on or before the due date that is 09th November 2017 through online mode of application. Other details about the vacancy such as age criteria, required academic qualification, selection methodology, application fee, and how to apply online etc are mentioned below in the article. For Section Engineer Post: Interested Candidates must have completed four-year Engineering Degree in relevant discipline from any recognized university. For Junior Engineer, Station Controller and Train Operator Post: Interested Candidates must have completed three years Engineering Degree in relevant discipline from a recognized university. Selection Methodology: Candidate will be shortlisted on the basis of their performance in the personal interview round which is going to be conducted by Mumbai Metro Rail Corporation Limited. Pay Band: Selected candidates will get handsome amount of pay band as per the post. How to Apply Online for Mumbai Metro Rail Corporation Junior Engineer Recruitment 2017? Interested aspirants who are willing to apply online for this MMRCL Recruitment 2017 they may check the eligibility conditions of the recruitment from the official advertisement then if you meet all the eligibility conditions then you may fill the online application form and submit it on or before the deadline date which is 09th November 2017 through online mode of application form. Firstly, interested candidates must visit the official website of Mumbai Metro Railway Corporation Limited i.e. www.mmrcl.com. After that, click on the relevant link. Open the notification and Read the instructions from the official notification very carefully before applying for the post. Then, Click on an apply online tab. Now, you can fill all the asked details in the application form without making any mistake. Verify all the filled details then click on the submit tab option. Take a print out copy of the MMRCL Junior Engineer Application Form 2017 and keep it safe for further use. 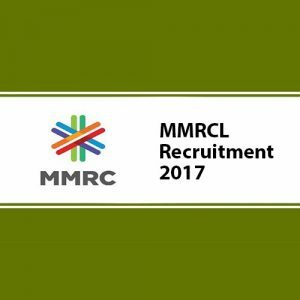 In the above description of the article, we mentioned all the information regarding the MMRCL Recruitment 2017. All the interested and skilled candidates must read this article and then apply online for this vacancy from the official portal of the department. If any of the aspirants face any kind of problem then you can leave a comment in the comment box and then we will reply your question as early as possible.